A beginner's guide to thinking and drinking pink. 1. First and foremost: There's no shame in drinking pink wine. Compared with its red and white cousins, rosé wine still takes a preposterous amount of sass from wine snobs and noobs alike. Rosé haters are either a) sad and ignorant enough to think that "pink is for girls," or b) individuals who were exposed at a young and impressionable age to white zinfandel (a sugary, mass-produced excuse for wine that rose to power in 1970s California) or pink André (basically champagne-flavored soda). Sure, there's crappy rosé out there, but there's also crappy everything else. Skip the gallon-size jug of pink dishwater and you'll be fine. 2. Mixing red and white wine together is not how you make rosé. To make most rosé wine, red grapes are lightly crushed and left to macerate with their red skins for a little while (anywhere from a few hours to a few days), after which the juice is strained out from the solid stuff (called "must") and fermented in tanks. The longer the grapes' skins are left sitting in the wine, the darker the color of the finished rosé. ...and the more it'll take on the deeper, more tannic characteristics you find in red wine. As it happens, red wine is made in a similar way. Red grapes have white insides and produce clear juice, so you can make any color wine with them. It's the length of time that the juice is left to hang out with the dark skins that determines whether it'll be white, pink, or red. 3. You can make rosé anywhere in the world, from almost any grape. Rosé isn't from a specific grape or region; it's just a genre of wine, like red or white. The biggest producers by volume are France, Spain (where it's "rosado"), Italy ("rosato"), and the United States. But there's also excellent stuff coming from South America (Chile, Uruguay), Germany, and Australia, and more corners of the world. Most rosé wines are blends of multiple grapes. Some of the most common grape varieties used in dry/European-style rosé are Grenache, Sangiovese, Syrah, Mourvèdre, Carignan, Cinsault, and Pinot Noir. 4. With rosé, the newest vintage = the freshest wine. Rosé, unlike red wine and Helen Mirren, does not improve over the years — so don't get any ideas about hoarding it in your cellar for half a century. There's no shame in drinking something with last year printed on the label. You shouldn't drink (and probably won't find) anything that's dated more than two or three years back. 5. This is the most important question to ask when you buy rosé: Is it DRY? Dry = not sweet. And that's what you want: a wine that's fresh and acidic, without extra sugar to bury its mineral/fruity/whatever flavors and aromas. Remember, it was super-sweet white zinfandel and its mass-produced brethren that gave rosé a bad name to begin with. There are tons of exceptions to this (some California rosés can be super-subtle and bone-dry; some European wines have higher sugar levels), but it can be a helpful way to narrow down your options at the wine store if you're feeling overwhelmed. When in doubt, look for something from France — specifically, Provence. France is the motherland of traditional, dry rosé (hence its name), and it's hard to go too far wrong with anything from Provence, the Rhône valley, or the Loire valley. Provençal rosé (made in southern France) tend to be very pale pink, sometimes salmon-colored. The tasting notes that you hear most often for these wines are strawberry, raspberry, and citrus. If you're interested in finding a store near you that carries some of these wines, check out this directory. Also a great option, if you're not feeling the French stuff: Spanish rosados. These tend to be a little bigger and bolder than their French neighbors, with deeper pink color and up-front fruit flavors that work well with meat. They're also less hyped and thus usually a good bargain. 6. You do not need to pay more than $15 for a bottle. 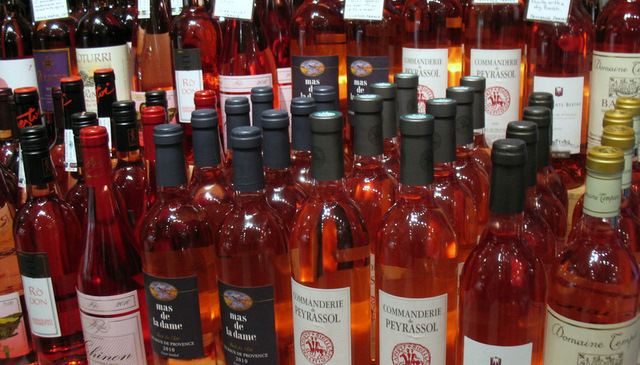 Rosés are usually a bargain, especially compared with red wines. These wines are young (vs. matured for a long time) and relatively cheap to make. They're also still underappreciated/undervalued in the U.S., which explains why French rosé is affordable despite the fact that most French imports are pretty pricey for American consumers. You'll have plenty of good options in the $10–$15 range (or less, if you shop at Trader Joe's). And even if you want to splurge on the top of the line, you're looking at no more than $25 or $30. 7. You can/should drink it with BBQ. Calling wine "food-friendly" is an annoying cliché (it's sort of like calling ketchup "burger-friendly"), but in the case of rosé, it's not totally wrong. These wines are versatile because they fall in between the extremes of red and white — less intense than a big, tannic, mouth-busting red, but with more depth than a super-light white. That happy-medium flavor profile (and the fact that different varietals span a broad spectrum from bright and zippy to darker and meatier) means you can almost always find one that plays nice with what you're eating — fish, veggies, chicken, grilled steak, potato chips, chocolate chip cookies, you name it. Just make sure you give it time to chill before drinking (like you would with a white wine). It's the perfect barbecue wine, the perfect beach wine, and the perfect picnic wine, but it's also the perfect sitting-around-watching-TV wine. 8. You can/should use it to make cocktails. OK! You're officially ready for rosé season. Don't be afraid to just walk into a wine store and try whatever appeals; you can always ask someone to help you find "a dry rosé under $15." But if you want a few names/labels to look out for this summer, the Village Voice has a handful of Provence and Rioja wines to try, and the Washington Post and Forbes each have recent roundups of recommended 2012 bottles from all over the globe.